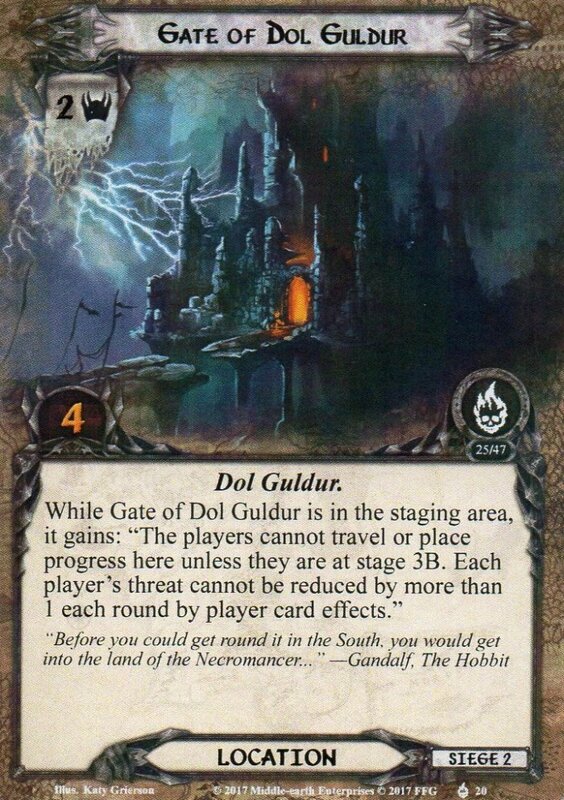 While Gate of Dol Guldur is in the staging area, it gains: "The player cannot travel or place progress here unless they are at stage 3B. Each player's threat cannot be reduced by more than 1 each round by player card effects." While The Sorcerer's Tower is in the staging area, it gains: "The players cannot travel or place progress here unless they are at stage 3D. Forced: After a 'when revealed' effect is canceled, reveal the top card of the encounter deck." 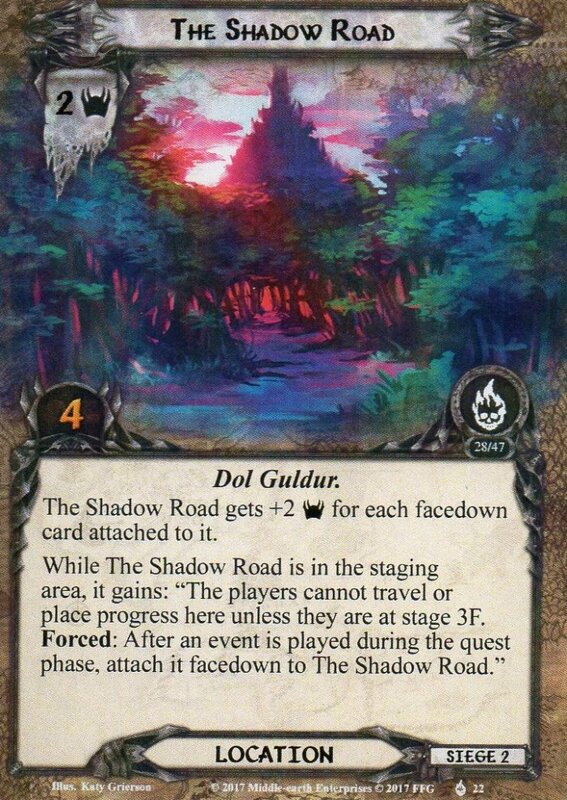 The Shadow Road gets +2 Threat for each facedown card attached to it. While The Shadow Road is in the staging area, it gains: "The players cannot travel or place progress here unless they are at stage 3F. Forced: After an event is played during the quest phase, attach it facedown to The Shadow Road." While The Sorcerer's Tower is in the staging area, each treachery gains Doomed 1. Forced: When the Sorcerer's Tower is explored, shuffle the encounter discard pile into the encounter deck and discard cards from the top until a treachery is discarded. Resolve the 'when revealed' effects on that treachery. 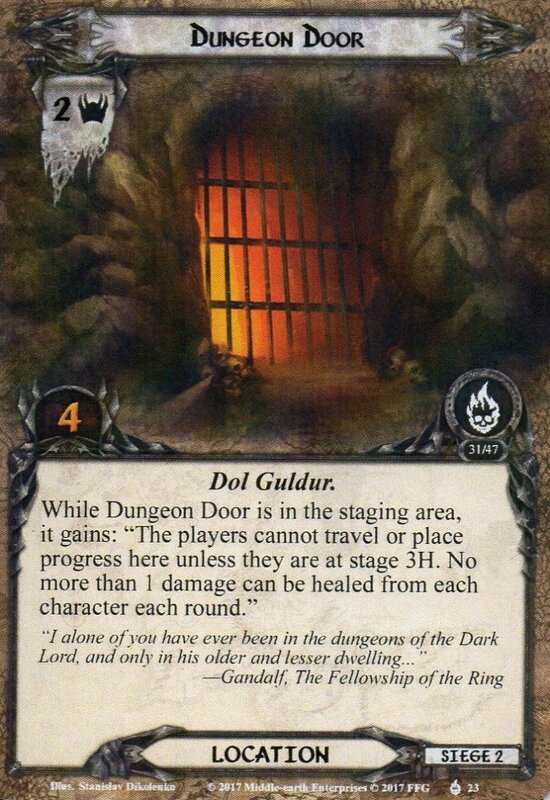 When Revealed: Add 1 resource token to each Dol Guldur location in play. Shadow: Any hero damaged but not defeated by this attack is turned face down, as a "prisoner." Then, if the players are on stage 3, return to stage 2B of the quest. If there are any unclaimed objectives in play, Spider of Dol Guldur gains surge. Shadow: Attacking enemy gets +3 Attack for each unclaimed objective in play. If Torture Chamber has 4 or more resource tokens on it, all "prisoners" were killed, and the players have lost the game. 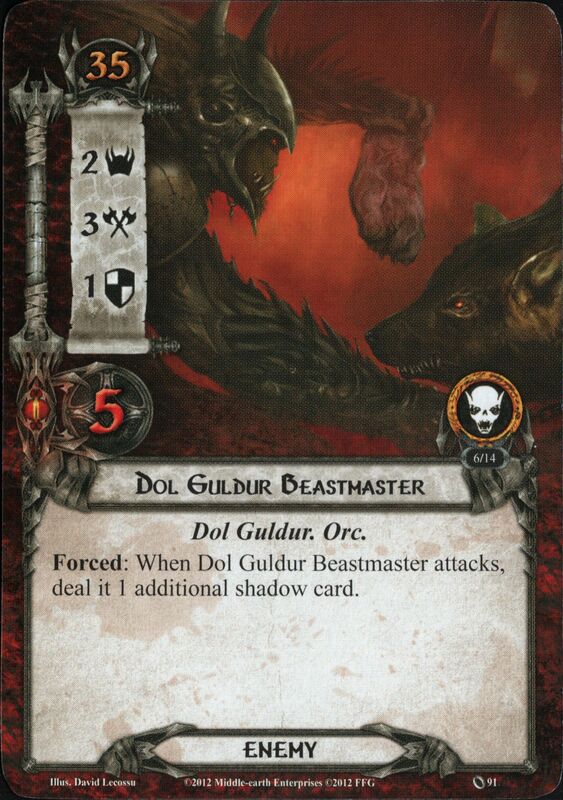 Forced: At the end of each round, place 1 resource token on each Dol Guldur location in play. Dungeon Labyrinth gets +1 Threat and +1 quest point for each resource token on it Forced: At the end of each round, place 1 resource token on Dungeon Labyrinth for each player in the game.